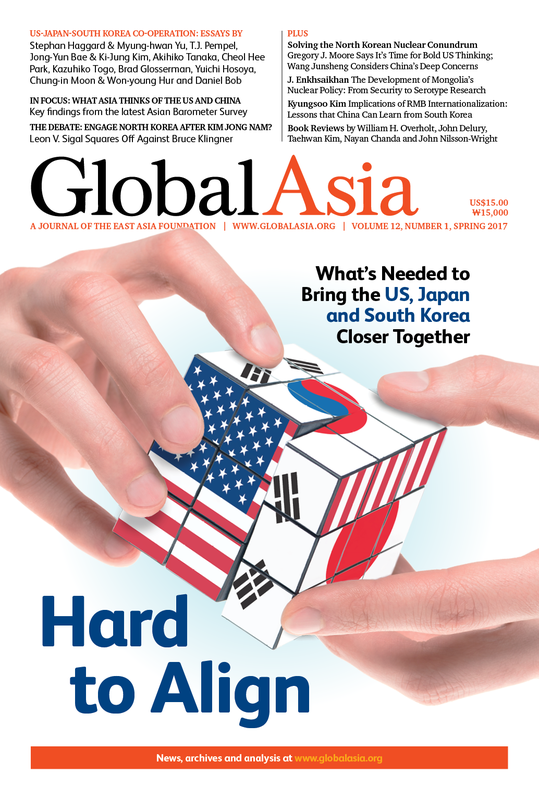 Although long in the planning, the cover package of this issue of Global Asia on the need for closer trilateral relations among the US, Japan and South Korea could not have come at a more auspicious time. As we went to press, the Constitutional Court in Seoul upheld the impeachment of President Park Geun-hye, a historic ruling that removed her from office and set the stage for elections on May 9 that could bring a liberal president back to the Blue House for the first time since 2008. The fledgling administration of US President Donald Trump, meanwhile, has generated unprecedented uncertainty in foreign policymaking circles worldwide, forcing allies and enemies alike to parse social media and personnel appointments for any clue as to the likely direction of US foreign policy in the four years ahead. Japanese Prime Minister Shinzo Abe, no doubt aware of the stakes, was the first leader to meet Trump after both his election and inauguration, signaling how important the relationship with Washington is to Tokyo’s place in Asia and the world. Against this backdrop of uncertainty in South Korea and the US, North Korea continues its provocative missile tests and has been implicated in the brazen assassination of Kim Jong Un’s half-brother, Kim Jong Nam, in Kuala Lumpur in a murder involving the nerve agent VX, classified by the UN as a weapon of mass destruction. China, meanwhile, has halted North Korean coal imports to ramp up pressure on Pyongyang, a move welcomed by Washington, but Beijing too is uncertain and wary of US policy, and has been angered by the first steps the US has taken to deploy the THAAD missile defense system in South Korea. In short, at no time in recent years has the need for closer co-operation among the US, Japan and South Korea been more evident — but obstacles abound. Under the co-editorship of Stephen Haggard and Myung-hwan Yu, our cover package explores what impedes and what could enable a closer trilateral relationship. The Korea-Pacific Program and the Graduate School of Global Policy and Strategy at the University of California at San Diego, with support from the Asia Research Fund and the Pacific Century Institute, invited scholars and practitioners from both sides of the Pacific to examine the issues. The articles here are among the outcomes of that gathering. Elsewhere in this edition, we debate whether it is still possible to engage Pyongyang following the assassination of Kim Jong Nam. And in our Features section, we look at the need for a new US approach to North Korea; examine China’s perspective on Pyongyang’s nuclear tests; explore what Beijing could learn from Seoul as it moves to internationalize the use of its currency, the yuan; and provide a case study of how Mongolia, sandwiched between two nuclear powers, has forged a unique approach to nuclear security issues. Our In Focus section, meanwhile, presents the latest findings of the Asian Barometer Survey on differing perceptions in Asia of the influence of China and the US. We round out this edition with our usual banquet of reviews of books about Asia. Tokyo and Seoul are indisputably Washington’s two most important allies in Asia. They are not only central to America’s security architecture for the region, they are also important economic partners and share common values such as democracy and a commitment to the rule of law. And yet the prospect of a deep and effective trilateral relationship among the three countries has proved elusive. Is there a path forward? Seoul and Tokyo have been unable to put to rest the specter of various tensions. South Korea’s often unique views are rooted in historical experience. US-Japan- Korea Co-operation: Where Next? An introduction to the cover story authors. The thorny issues between Japan and South Korea hinder the US from achieving its regional policy goals. Finding the right mix of policies trilaterally. Differences over the issue have festered between the two countries for decades. What obstacles remain? Tips from recent Japan-US steps. Domestic politics in Japan and South Korea have bedeviled US efforts to forge closer trilateral relations. Seoul hasn’t convinced South Koreans of the value of stronger security co-operation with Japan. Nothing has created as much uncertainty lately in Northeast Asia than the new US president. Is it Still Possible to Engage North Korea After the Assassination of Kim Jong Nam? The killing should not impede the new US President. It is a fool’s errand to resume talks without change. Why “pre-emptive recognition” of North Korea by the US might achieve a denuclearized peninsula. How deep China’s concerns are and how they might be addressed. Declaring itself a nuclear-weapons-free zone was just the start of Mongolia’s quest to forge a sustainable nuclear policy. China’s ambition to see its currency used in the global financial system has risks, as South Korea has learned. Policy-makers take note: the latest Asian Barometer Survey shows tectonic shifts. The battle for soft-power supremacy among Great Powers in East Asia holds surprises. Ideology, culture and domestic politics all play a role in Asian views of the super-powers’ influence. China may be gaining an edge. The Perfect Dictatorship: China in the 21st Century, by Stein Ringen.